Adobe has entered the learning management system market with the introduction of Adobe Captivate Prime. The company has also released an updated version of Captivate, its e-learning authoring tool. 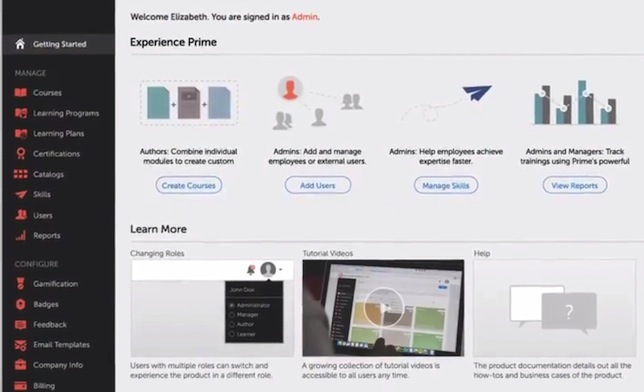 Captivate Prime, intended primarily for the corporate training market, is a cloud-based service that lets an instructor set up a course by creating modules from multimedia e-learning content, grouping modules into a course, and then grouping courses together to create a full learning program. Reporting functionality includes dashboard displays showing student- and organization-level progress. It uses gamification points to recognize learners within the group as they achieve targets. The program runs on standard computers as well as tablets. Fluidic Player, the media player used by the service, can display or run multiple formats, including Adobe, PowerPoint, Word, video and SCORM, on those devices without the need for special plug-ins. Users can bookmark and add notes to the content for later review. Because the Captivate Prime app downloads learning content onto a tablet, users can also access content offline. When the device is back online, the program auto-syncs. Captivate Prime is priced at $48 per year per registered user and is available only in English. Besides working with the new LMS, the latest release of Adobe Captivate, version 9, has been updated to allow mobile device users to create content too, through a new storyboarding app named Captivate Draft, available for the iPad. The contents from Draft can be imported by the full program. The service includes access to a library of e-learning assets, including games, interactions, scenarios and characters. Once a course is built, it can be published to Captivate Prime for learner access. The new service is available for $29.99 per month. A student or teacher license is $349.